Singer, songwriter, actor and philanthropist Willie Nelson was born on April 30, 1933, in Abbott, Texas. During his extensive career, Nelson has written more than 2,500 songs and has released close to 300 albums. He has won multiple awards, including countless Grammys, American Music Awards and Country Music Awards. Willie Nelson has cancelled his current tour indefinitely due to a bus crash early Saturday morning outside of Sulphur Springs, Texas, that left three of his band members injured. Nelson, 80, was not on board the tour bus when it crashed into a bridge at about 3:30 a.m. on Interstate 30, NBC news reports. One of Nelson's band members suffered serious injuries and two others received minor injuries, trooper Sylvia Jennings says. All three were taken to Hopkins County Memorial Hospital, about 80 miles outside of Dallas. Nelson's website says the roads were icy and Jennings reported rain and high winds at the time of the accident. AUSTIN (KXAN) - Willie Nelson's nine-hole golf course in Briarcliff is up for sale and the asking price is $3 million, according to a local real estate website. "Own a piece of Texas History!," broker Laura Gottesman says on the site. Willie Nelson's Cut and Putt Pedernales Golf Course is for sale!" The course is a former country club and recording studio that looks out over the Pedernales River. I wonder if the grass smells like grass. Looks like Willie is on tour at Las Vegas, NV! Willie Nelson makes the World a better place to be. Steve Fromholz at Willie Nelson Picnic. Steven Fromholz, one of Austin's foremost songwriters during the 1970s outlaw country era, died Sunday from an accident with a firearm, his family reported. He was 68. Born in Temple, Fromholz rose to prominence with a 1976 solo album for ABC Records titled "A Rumor in My Own Time." One of its tracks, "I'd Have to Be Crazy," subsequently was recorded by Willie Nelson, who issued the 1978 Fromholz album "Jus' Playin' Along" on his Lone Star label. Fromholz later released several albums on his own label, Felicity, named after one of his two daughters. His other daughter, Darcie, also lives in Austin. Fromholz's career got a boost in 1998 when Lyle Lovett recorded all three songs of Fromholz's "Texas Trilogy" on his two-disc set "Step Inside This House," a tribute to Texas songwriters. The Trilogy initially appeared on Fromholz's first record, "Frummox," a 1969 duo project with Dan McCrimmon. It also inspired a book that Hillis and Bruce Jordan co-authored, "Texas Trilogy: Life in a Small Texas Town" (2002, University of Texas Press). Fromholz suffered a stroke about 10 years ago but had largely recovered over the years, Hillis said. In 2007, Fromholz was selected Poet Laureate of Texas. "I'd Have To Be Crazy" was written by Steven Fromholz. Not a Country fan, but love me some Willie!! His voice is so distinct -- what talent. Nelson is due to receive his fifth degree black belt in the art of Gong Kwon Yu Sul, a modern Korean martial arts system, on April 28 at a martial arts studio in Austin, according to his publicist, Elaine Shock. The following day, the troubadour will turn 81, which should make us all feel incredibly lazy. Shock said that for the past 20 years Nelson has been training in the art of Tae Kwon Do and Gong Kwon Yu Sul, often practicing while in his bus on his seemingly never-ending tour with his family of musicians. His teacher at Master Martial Arts, the Korean-born Grand Master Sam Um, also directed Nelson in the 2007 film Fighting With Anger. Nelson did all his own stunts the movie too, Um adds. Um said Nelson first came to his studio 20 years ago with his wife and kids to sign them up for classes. He said Nelson stuck with the classes after his family got older and moved to Hawaii. They struck up a friendship over martial arts that has stayed strong. At Nelson’s age — he was in his sixties when he came to Um — his teacher worried he would get hurt on the studio’s wooden floors. Um said Nelson more than holds his own practicing the mixed martial art, which features elements of kickboxing and Judo. Willie Nelson received his fifth-degree black belt in a martial art called GongKwon Yusul, a discipline with Korean roots which Nelson says he’s practiced for 20 years. “It's just good for you physically. For your lungs. The more you're breathing, exercising, the better you’re going to feel,” said Nelson from his tour bus in an exclusive interview with KVUE Monday night. Willie Nelson was inducted into the Austin City Limits Hall of Fame this past weekend. Monday he received his fifth-degree black belt and on Tuesday, the father of eight celebrates his 81st birthday in a concert at The Backyard. Nelson also has a new CD called “Band of Brothers” which comes out in June. AUSTIN (KXAN) — A man in Tyler is trying to sell the bus Willie Nelson used to tour in the 80s… on Craigslist. The wooden, velvety interior looks in good condition and comes complete with stain glass windows and Native American artwork. The bus is going for $29,999 although the owner does not say why he is trying to get rid of this old school relic. AUSTIN, Texas (AP) — Country star, actor and farm advocate Willie Nelson has donated many of his platinum records, manuscripts and creative documents to the University of Texas. UT’s Dolph Briscoe Center for American History on Thursday announced Nelson’s gift. The Willie Nelson Collection in Austin will be the focus of an upcoming exhibit. UT officials say the collection includes letters and photos from fellow musicians including Dolly Parton, Johnny Cash, Kris Kristofferson, Merle Haggard and Lionel Richie. The items also pay tribute to Nelson’s fans and their gifts and notes to him over the years. Grammy-winning Nelson, who turned 81 last month, co-founded the Farm Aid movement to help family farmers. He’s also appeared in more than three dozen films and television shows. 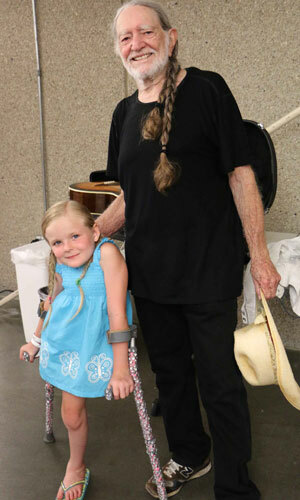 Willie Nelson spent his weekend fulfilling one little girl’s big dreams. On Friday night (July 11), Nelson took the stage at the Starlight Theatre in Kansas City, Missouri, joined by Jason Isbell and co-headliner Allison Krauss and Union Station. And it was there that the singer met adorable audience member named Tatum Lee. Tatum made the 2-and-a-half-hour drive from Joplin, Missouri to Kansas City with her family. It was all thanks to the loving volunteers with the Make a Wish Foundation, who arranged for Tatum to meet her favorite singer, Nelson. But they didn’t just meet — she was also lucky enough to get her guitar signed and a photo with the legend. The little girl relies on music a great deal, especially every four months when she has operations to extend the rods in her back. Her next surgery is rapidly approaching, but now she’ll have memories of seeing her favorite singer, Willie Nelson, to help get her through. More pictures from the meeting are on Nelson’s official website. Ever wanted to own Willie Nelson‘s braids? Now is your chance. A collection of items from Waylon Jennings‘ personal inventory will be on the auction block this Fall, including Nelson’s hair. More than 2,000 items are being sold off Oct. 5 at the Musical Instrument Museum in Phoenix, Arizona. Most of the items come from Jennings’ close music business friends, including Buddy Holly. The icon’s Ariel Cyclone motorcycle is one of the biggest items being auctioned. The bike was given to Jennings after Holly was killed in a plane crash. Jennings’ relationship with the late star stemmed from the two playing together early in his career — the singer was a member of Holly’s band, the Crickets. Other hot items include a robe and boxing gloves from the great Muhammad Ali, Hank Williams’ Nudie cowboy boots and a handwritten letter from John Lennon to Jennings. The country legend’s personal items, like handwritten lyrics, are also in the auction. The set of Nelson’s braids — famous in their own right — were chopped off in 1983, a message of support from the ‘On the Road Again’ hitmaker to Jennings while he was trying to maintain sobriety. 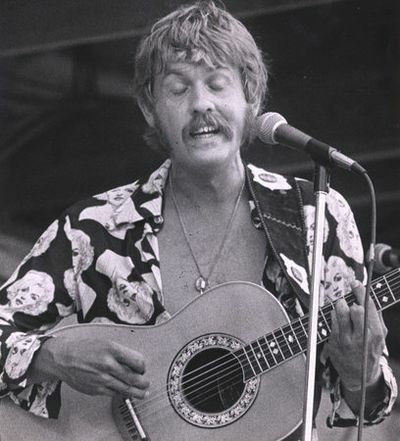 Jennings died in 2002 at the age of 64 following complications from diabetes. The upcoming auction of his belongings is a means of bringing awareness to the Phoenix Children’s Hospital and the work they do. Later this month, the items will be available for viewing in a catalog collection. Page created in 10.155 seconds with 21 queries.